Continuing Zawinul’s recent collaborative efforts, he will perform two concerts with Kristjan Järvi’s New York-based, Grammy-nominated Absolute Ensemble on September 17 and 18. Joining them will be long-time Syndicate member Sabine Kabongo. The performances promise to include some Zawinul compositions that have yet to be heard, as well as reworkings of some well-known tunes. Also on the schedule is a rare Zawinul Syndicate performance in South Korea, sandwiched by performances in Austria, and a recently added date in Northampton, Massachusetts. See the Tour Dates page for details. Rittor Music has published a new book in Japanese, Joe Zawinul On The Creative Process. I don’t read Japanese, but the Google translation of Rittor’s web page makes it sound pretty interesting, despite Google’s Japanese-to-English limitations. Zawinul tells me that an English translation of the book has already been completed, and a publisher for it is being sought in the states or in the UK. 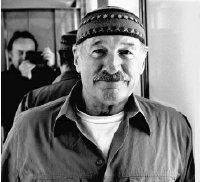 A Zawinul Online visitor recently brought to my attention a well-done profile of Zawinul by John L. Walters, music reviewer for The Guardian. It’s worth a read, with lots of interesting anecdotes about Joe’s life and career.